Here's a little snippet of dinnertime with the 24 Paws of Love. The puppy from our litter named Grumpy was my husband's favorite. He loved them all, but Grumpy somehow snagged Mark's heartstrings. Mark wanted to keep them all but if he couldn't he wanted to at least keep Grumpy. Zappa and Fiona were already a given, and three puppies all at once would've been too much, so we did our best to find Grumpy a good home. The call we got last February wasn't the first one where the owner wanted to give Grumpy up. Nothing ever materialized out of it so we just kept hoping to see Grumpy as an adult and see that he was OK. So when we did get the call last year, saw him and then a freak snowstorm stopped us from picking him up, I didn't think it would be the last time we'd hear from them. In fact, I started planning everything I did for when the call came in. I really started working with the two packs to begin the process of uniting them and that meant mostly working with Brut and the Back Dogs in bringing them together. I worked especially with Brut, his aggression, his food and toy possessions while he was around the other dogs. He learned how to take turns during play and how to pose for pictures. When I would be sitting there figuring out what to do with my day, I thought of Grumpy, and would continue to work towards the goal of when he would inevitably would come to live with us. While I still couldn't unite the two packs, I could get them ready for when Grumpy finally came home. The whole thing was a surprise for Mark who didn't know I was working with the dogs for the special day. I became so wrapped up in this journey and Grumpy was still so far away that when I heard the news the owner put Grumpy down, I was in a state of shock, but more disbelief. I had had no doubt that Grumpy was coming home, it was just a matter of when. It wasn't until months later I remembered what had started me down this intense journey of unity and was jarred into reality and shattered my dreams. Grumpy was gone. All of my work while still beneficial fell limp at my feet as if it were Grumpy's body. The dog bed had been pulled out from under me and it was the first time I really cried for Grumpy. Sobbing to my husband, my plan, my ideas and my end goal. I wanted Grumpy to come home too. He was the whole reason for my labor of love and I wanted nothing more than to surprise my husband with his favorite dog in his arms. And now I can only thank Grumpy for leading me down this path that will eventually lead us to being the 24 Paws of Love. Today we have a long overdue guest and special one at that. 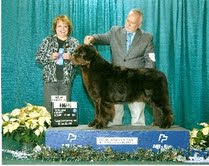 Please welcome Jen, from My Brown Newfies to talk about dog showing with her two dogs, Leroy and Sherman. Now personally I've always been a critic of the sport and thought it was just a show of the prettiest and most popular dog. 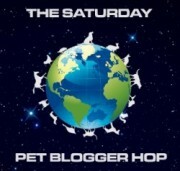 But like many myths that have been squashed by dog bloggers I thought I take the chance to open my mind with a blogger I have come to trust with the subject. I asked Jen to share her personal experience with the world of dog showing and her beloved boys. So first, how long have you been showing and what made you get started? I have been showing for about 4 years now. I was first introduced to the show ring about 15 years ago by my sister who was periodically showing her brown Newf. The first show I went to with her I was hooked. I just loved the scene and I loved the sport. 2 short years later I got my first Newfoundland who was named Thunder, we showed one time and that was it. As soon as we stepped in the ring it was clear that Thunder wanted nothing to do with showing so that was how it would be. I didn't understand the sport of dog showing back then, and if I had I never would of even showed Thunder because he was not a good example of the breed, and by that I mean that he had a heart murmur and a condition called SAS(sub aortic stenosis) which is a condition that Newfs are prone to. Thunder was not a dog that could of been bred because this condition is hereditary., so therefore putting him out in the show ring as a good example of the breed would of basically been lying. I didn't get that 15 years ago, but I get it now. Many years later I got Sherman. 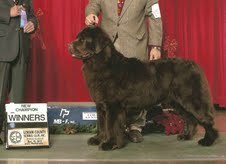 I had spent over 1 1/2 years researching breeders and speaking to them one on one and learning about the the Newfoundland breed. Many reputable breeders are hesitant to give a show dog to someone they don't know so establishing a relationship with the breeder was key for both me and the breeder. I didn't just call someone and say I wanted a show dog and they said "ok here you go" I actually established a relationship over months with the breeder before she agreed to give me a puppy to show. Sherman and I entered into the show for the first time when he was 9 months. I showed Sherman for a few times after that and then I decided that I wasn't the best handler for him so I hired someone to do it for me. I enjoy being on the outside watching, rather than in the ring. What exactly is the sport of dog showing? It is obviously more than who has the prettiest dog. You also mention that Thunder wouldn't have been a good dog to breed, is that something else that is part of the sport? The sport of dog showing is intended to evaluate the breeding stock of future generations. Each breed has a standard that is created by their parent club. A breed standard is a written description of the ideal dog of that breed. The breed standard usually relates to the original function that that breed was bred to perform and general appearance, movement, temperament, and specific traits of that breed such as color, coat texture, eye color, ear shape and placement, feet, tail, etc. Some breed standards are more specific than others. It is basically showing that you have a dog that conforms to the breed standard and is a great example of the breed. That's the way it is suppose to work anyway. Thunder had a very bad heart and would not of been a dog to breed. 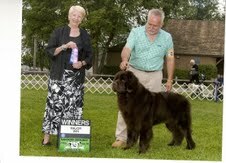 He wasn't healthy and he would not be bettering the Newfoundland breed by siring a litter. Could I have bred him and taken a chance that his bad heart wouldn't be passed down? Yes, but that wasn't a risk I was willing to take. Ever since Blaze came back and we discovered she was the only girl out of the litter who could have puppies, we knew that we wanted to breed her. We like the make and model of our dogs and wanted to carry on the 24 Paws of Love line. And hopefully create a sled team with the litter. But after the false pregnancy that Blaze is going through, I'm beginning to think twice. A false pregnancy is when after the heat (ovulation) is over, the body and mind act like their is a pregnancy even when there isn't one. It can be psychologically difficult on females depending on the severity of symptoms. Physically females can have large and swollen teats, sometimes so much that they produce milk. Physiologically the dogs believe they are pregnant and may eat little or not at all, begin nesting behaviors and horde toys with a sense that these are their puppies. They may also become depressed, lack energy, become moody and some may go the extreme of becoming aggressive It is still up for debate whether false pregnancies are hereditary or if they are a natural part of the cycle of a female dog and some don't even believe it exist. Blaze goes into heat twice and year and follows with a false pregnancy that last about as long as a normal gestation period of about nine weeks. Her mood will become low and depressed like. She will also become more affectionate and clinging during this time as though she would rather cuddle than go out to play. And in the last few weeks of those nine weeks, she has a toy or two that she casually carries, guards and keeps around. She has no problem leaving the toy inside or out and doesn't need to keep it close while she she plays, eat and does her business. Her mood begins to lighten during this time period and she is a happy girl pretending to be a mom as the last of her symptoms will finally lift. What a dog and a fishing pole with a toy can do! Without the EZ Harness my arm is ready to pop! I'm still working with the dogs with the EZ Walk Harness and I've got to tell you what a huge relief it is. I have never been 100% comfortable with the nose harness (like a Halti) and still feel bad for using it, but with the EZ walk harness it is like a huge weight has been lifted. It is easy to use and control, but the biggest relief is that the dogs are so relaxed and comfortable in it, which eases my consciousness. Even Brut. And while we still have some practicing to do I am thoroughly impressed with the ease and toll it takes off my body. The bursitis in my shoulder is thanking me immensely. For some reason some of the dogs are taking to the harness so well, I barely have to do anything but enjoy the walk, like with Fiona, Chance and Zappa. It really is quite mind blowing, to go from some form of tension and pulling on the leash to hardly any. Even Brut, Mr. Determined seems to be thrown from plowing forward any way he wants to go by letting up on the leash. I'll have a long way to go with him, but he hasn't reached any level of frustration or copped an attitude yet, so we are doing great! One thing I love about the brand of EZ Walk Harness that we got it has two clasps, one for the chest and one that goes around the back and because of that I don't have to slip the harness over anyone's head. That is a gift. I don't know if they are all designed that way, but I'd never get it on some of the dogs if it had to go over their heads. And so we are rocking and rolling with the EZ Walk Harness and I couldn't be more pleased. I meant to get photos of the dogs wearing them, but I completely forgot the last time we were out and today it rained, so please forgive me. You'll just have to take our word that it is working for us! I got the chance to talk 'dog' with the dental assistant. Once we started sharing, she was pulling out her phone to show me pictures of her beautiful dogs. She had two Sheperds and a Bull Mastiff that were all just gorgeous. Since I didn't have any pics on me, it would have been a perfect opportunity to give her the blog address, but unlike my husband who will boast to anyone that will listen, I'm too chicken. And besides I was just enjoying watching another human light up talking about their furry loves with another dog lover. Chance (Front Dogs)and Silver got to hang out together when Daddy took Blaze for a ride and left Chance all alone. So I invited Silver from the Back Dogs so he could have some company. And we played games after Silver marked every part of Blaze's yard. BOL! We know who's top female here! Silver and Chance don't really play together but Chance will try to paw and pounce at Silver and after a quick snap from Silver, Chance will start tearing around the yard and coming back for more. That's about the extension of their play, but they are good together and respect each other and they even posed for some pics together. like these peanut butter, carrot milkbones. And the Bully Sticks we bought at Christmas time finally came out for everyone to enjoy. And some that we helped ourselves to. We enjoyed our week off with plenty of dog walks and making dirt pies.. Always wish vacations could be longer, but we were grateful for the time together. How was your week? P.S. Our 24 Paws are crossed for Peggy, Kelly and her family at Peggy's Pet Place after losing Brooks this past weekend. Our hearts go out to all of them.